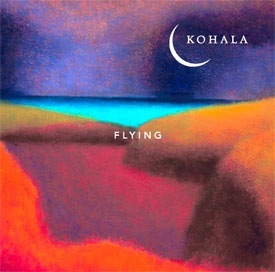 “Flying” is Kohala°s third CD, and was recorded during the summer of 2000 in Kamuela, on the Big Island of Hawaii. Here, in their classic Kohala style, they perform instrumental arrangements of Hawaii°s contemporary hit songs. Kohala°s style reflects the gentle life and natural beauty of the region after which they were named. Guitarists: Charles Michael Brotman (heard in the center) plays the lead on his nylon string classical guitar; Kevin Teves (heard on the right speaker), and Charlie Recaido (on the left) play acoustic finger-style guitar. The handmade guitars used on this recording were made by Eric Sahlin and James Goodall. Produced, engineered, mixed, and mastered by Charles Michael Brotman at Lava Tracks Recording Studio in Kamuela, Hawaii. This collection assembles songs that have been favorites in Hawai‘i for the past three decades, and hearing them without lyrics, you gain new respect and appreciation for their unbridled simplicity. The material includes a handful of Kalapana-linked hits, such as “Nightbird,” “For You I’d Chase a Rainbow” and “Juliet,” plus a Henry Kapono signature (“Friends”) and one by Cecilio Rodrigues (“Summer Lady”). Patrick Downes’ “Flying” (a Peter Moon Band smash that featured Martin Pahinui) and Robert Wilson’s “Follow That Road” (and a trademark for Pauline Wilson) take on new, ethereal beauty with the quiet, uncluttered arrangements. And Wade Cambern’s “Love and Honesty” doesn’t lose any luster without Robi Kahakalau’s missing vocals. Group leader Brotman’s jaunty original, “Mango Cooler,” fits well into this family of gentle giants, reflecting – like the rest of the fare – the beauty and the charms that constitute Hawai‘i.